Home Eye Care Blepharitis: What Is It and How Does It Impact Your Eyes? Are your eyelids ever red, swollen, sticky or itchy? Do you ever wake up with hardened or crusty eyelashes? Are your eyes constantly red, watery or sensitive to light? If so, you may be suffering from blepharitis. In the video below, Dr. Ryan Corte discusses what you need to know about blepharitis. 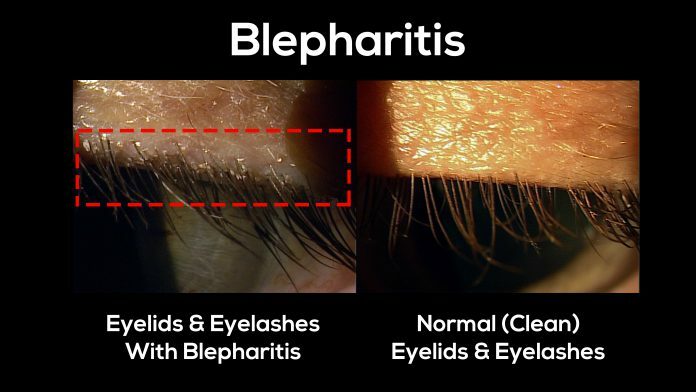 Blepharitis is a broad term that describes the swelling (or inflammation) of your eyelids and is actually quite common. In fact, it’s often associated with the natural bacteria (or mites) that live on your hair and skin or having clogged oil glands. Contrary to how it sounds, it is not known to be caused by poor hygiene. Unfortunately, if you have this condition you’re probably stuck with it for life as it rarely resolves completely. However, with proper eyelid hygiene and medical treatments, you and your eye doctor can effectively manage it over time. Curious if you have blepharitis? What are you waiting for? Make sure to schedule an appointment with your local eye care professional today! Previous articleLASIK: What Are the REAL Benefits? Next articleDiabetic Retinopathy: What Is It and Are You At Risk?